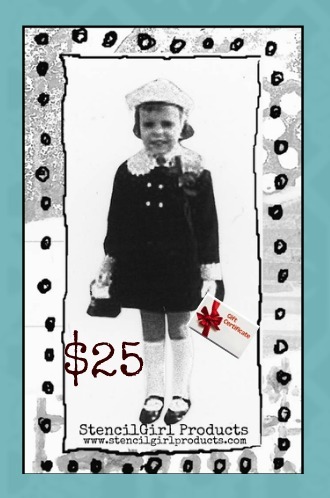 Welcome to the StencilGirl and Seth Apter Blog Hop. If you have arrived from my friend Janet's blog you are on the right track and have arrived at the last stop on the hop. If you are just visiting my blog today, welcome! The one thing I really do know is that art heals. What does it heal? Oh so many things....and sometimes it catches you totally off guard. This is one of those circumstances. I'm even going to go out on a limb here and say that this is probably one of my most significant, deep to the core sessions of art I have ever made. I just played and layered them. As you can see in the photo above, it was the last page in this little journal. 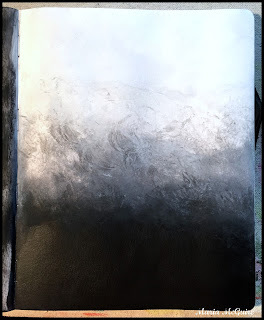 I had used up extra paint on my palette and although nice, I didn't think it was blog hop worthy. Also, at the time I wasn't really reading the words. It was "saved" as my Blog Hop inspiration piece. Fast forward to a few weeks later...I had to get it done. I opened to a page in my "good" (ha ha) journal to recreate the page. 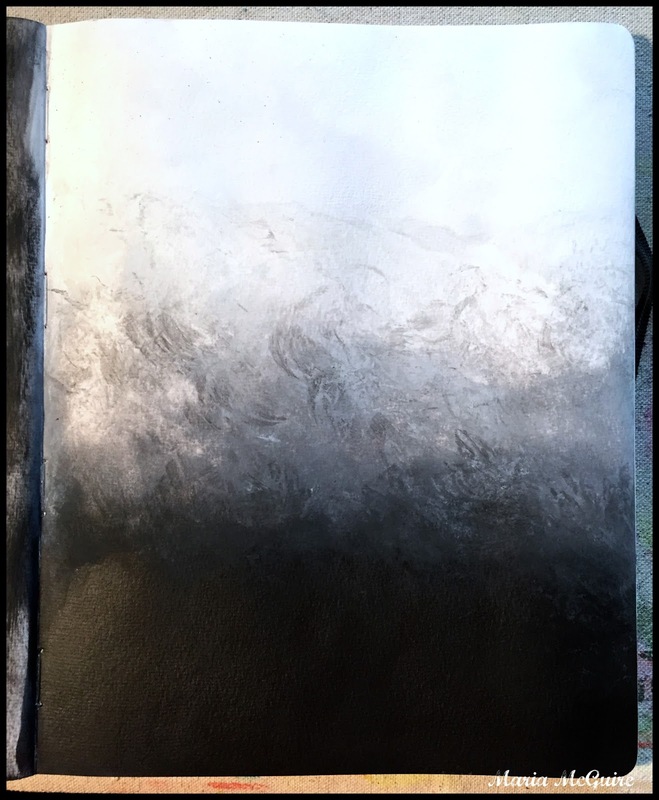 I noticed a trend in my left over paint pages...ombre. It all started out good layering the pieces of the Techno Insiders stencils onto the page. I decided to make a few of the elements on my page stand out. 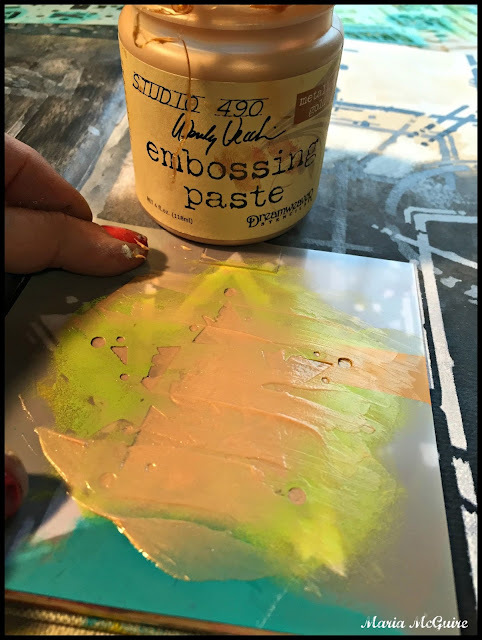 No better way than some Wendy Vecchi Embossing Paste! I LOVE this stuff! Not even dry yet (see the cloudiness in the gold)....and my innocent page took a turn. That word ENOUGH. Deep.... DEEP....DEEP meaning to me. This is where.....Mr. Apter....it took over as a therapy session. No more process photos, just me and my art journal figuring "IT" out. For every word there was another word....more than that....I didn't realize it at the time, but when I finally took a step back and looked at what I made, I realized I was cleaning off my stencils on the page beside my project each time. THIS is my real Art Journal page. You may not think this is Blog Hop worthy....but this is where the deep, layered feelings of the words got buried each time I cleaned a stencil onto this page. Stencils are cheaper than therapy! Who cares if anyone else likes it! Do you??!!! Thanks to everyone who read to the end because this isn't the end of my story....it is just the beginning. Like you said, art is therapeutic. Your "final" page is as cool as the first page you created! It can BE! Thanks for sharing! I absolutely love the layers and depth of the first piece you show- fabulous!! And your colors on the next- total yumminess!! Awesome showing of Seth's new stencils!! So wonderful seeing your process and reading about this special art session. Love your soul showing, Maria- I felt it! Thanks! ❤️ Can't wait to get my hands on the new stencils!! I agree. Creating art keeps me centered, grounded. What fun to play with Seth's new stencils. The stencils are great and the piece came out great. I love the ombre pieces. They are soft and relaxing. Very beautiful. The bright piece is pulsing with activity. Love the black and white and gold- and I love the page you cleaned your stencils on!! I've never even thought of doing anything like that, but I'm getting some great tips today! Thank you. Love "enough". These pages are beautiful! I LOVE your "non-hop worthy" pages Maria... and I agree on how great these stencils are for therapy! I had some of the same feelings as I was working with mine... so many of the words resonated with me. Beautiful job, and thanks for sharing all three pages! 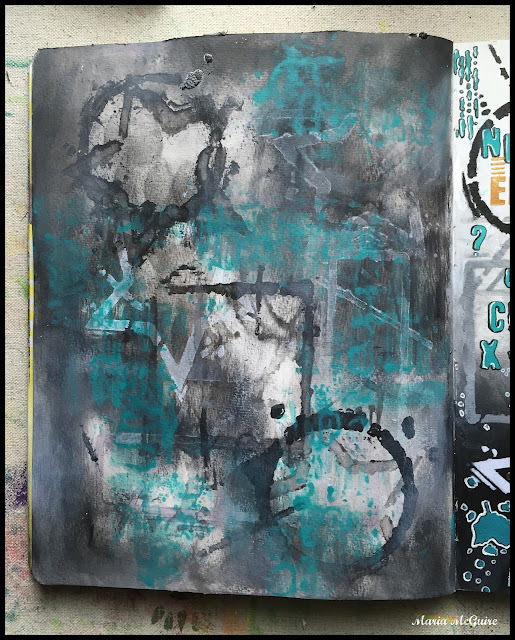 I love how you created this piece, starting with a page having been used to clean off a brayer. Love your process, Maria, and yes, I read til the end. Really like your piece. i love those purples and oranges! I love Seth's new release! Out of the box words. Beautiful art you've created! So happy you shared it and your healing process! Love your "stencil cleaning" therapy. I, too, find it a very therapeutic exercise every time I open a new spread to start another collection of stencil cleanings! awesome sauce.. loved it. wonderful colors... sigh. great new set of stencils. I think this is TRULY blog hop worthy and I love what you did. Of course, I adore these new stencils that Seth has created. He does wonderful work. In the event I win, Seth has my e-mail address. Love these! Great colors! Great works! Greats stencils! Oh Maria, I am always knocked out by your art. Wish I could watch your process. Beautiful and so worthy. Wow, Maria!! You are enough and LOVED your process!! Yes, art does heal and more!! Love your gorgeous mixed media work, by the way!!! VERY inspiring. Fun to see how you used them and the last photo of your page makes me happy to see- its what journaling is about for me layers of thought in color and form. What could be better than stencils AND stamps. I love all of them...they look like so much fun! Thank you for your inspiration. As always, Maria, you are so creative. Love the design! Love the sentiment! 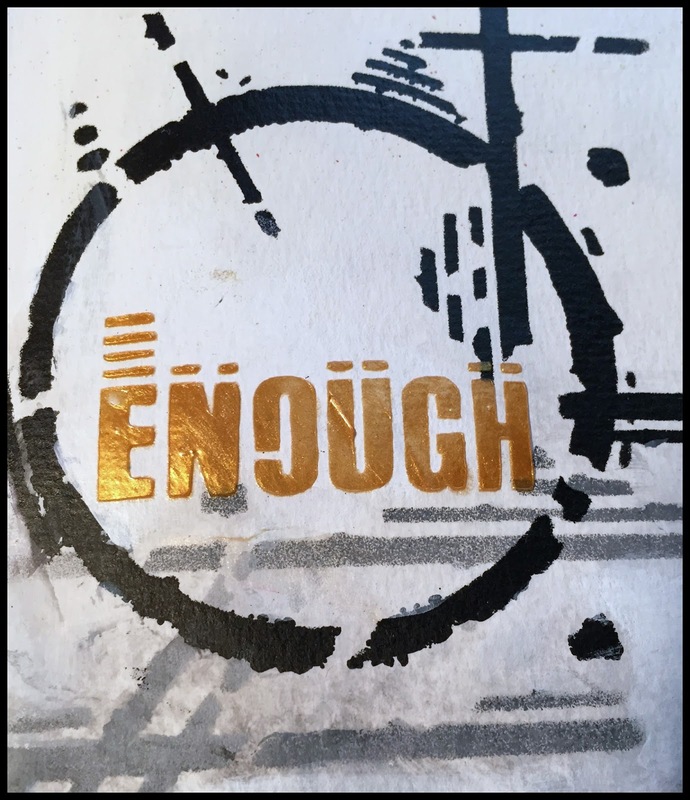 Art does heal and yes, we are "enough". Thanks for the inspiration! Your work is awesome. I love how you used these stencils to create texture! Dynamic! Its amazing what one word can do and what we tell ourselves in the art and the clean up. This is a WARNING! Your ideas are CONTAGIOUS!! Love them! Very nice pages! Even though I love color for some reason I especially like the black and white ones. Thanks for showing the versatility of these wonderful stencils. I really like the "dark feel" of your background. I imagine myself at Times Square at night with the bright signs. Love that one! Absolutely blog hop worthy, thanks for sharing your thoughts and feelings with us through this page! It really speaks loudly, love it. I would like to try new stencils. What a beautiful example of healing through art! Gorgeous work! I agree with you. Art does heal. Great pages. We are like your art... lots of layers. Absolutely bog hop worthy :) Love that your meaningful words are in there, under all the layers. I am such a purple girl.. I think I love your small journal just as much as your larger piece! ART does Heal.. and STENCIL like these sure help too.. lots of words.. that could resinate with how one feels at times.. not always all the time.. very immense reflecting could transpire using these! Awesome awesome job! I agree that Seth chose challenging and powerful words for his new stencils. I think you created some wonderful, beautiful work with them. Thanks for sharing your art and your heart. 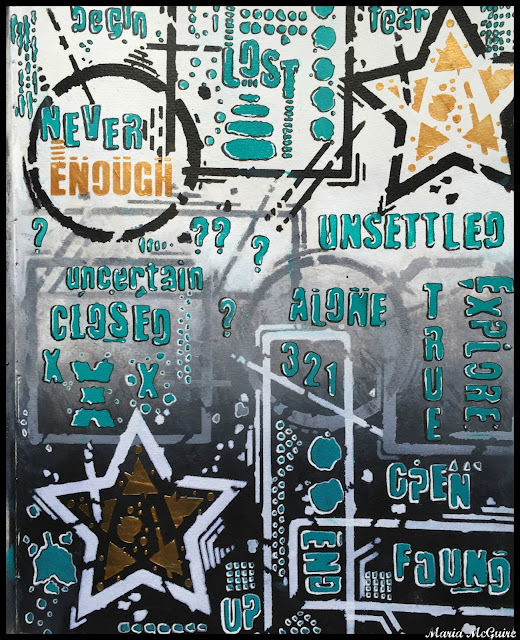 Love your colorway and how used Seth's stencils. Thanks for the chance to win as my stencil supply is very small. Stunning. Love what you've done with Seth's new stencils. Great colour choices. 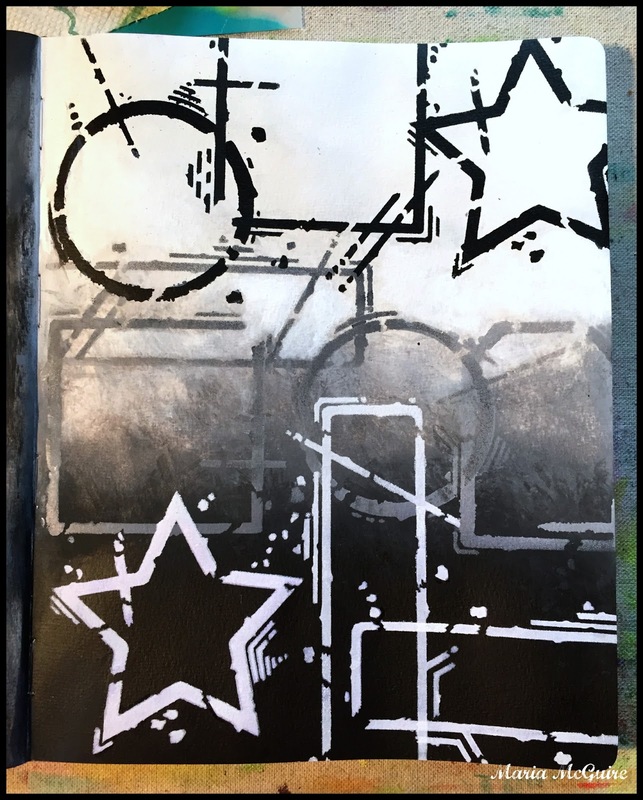 Thanks for showing how these stencils can be layered! Thanks for the chance to win!! WOW! What you've already done with Seth's stencils is a knockout. I can hardly wait to see what comes next. Yep, I think you're on to something, Maria.....art is very very powerful stuff. 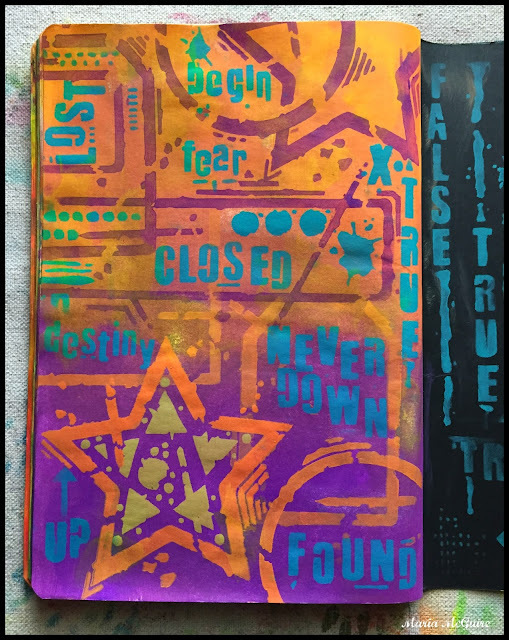 Love your story and the pages created using Seth's new stencils! It could not be better and so true. Art heals and these new stencils from Seth are super. Love your story and the end result. Stencils are cheaper than therapy! I love it. I really like your work, the turquoise and black, love the colour of the paste you used. I haven't dabbled in that stuff yet but these stencils would be a good start! Thanks, Maria, for sharing your insight as well as your art! I wish my stencil cleaning pages were that wonderful! I love both your pages - thank you for sharing both of them! Wow!! This is so true. Art is a super healer for me too...so many hidden messages just waiting for their chance! Thanks so much, and thanks for the chance to win! So gorgeous! I love the shine and pop from the paste! Stunning. Thanks so much for inspiring! This is so wonderful on so many levels. It's deep and thoughtful....and inspiring. The colors are perfect and the contrast is what I love the most. Bravo, my friend. Bravo! These stencils are awesome as is your fabulous project, love all the color. Thanks so much for sharing your talents with all of us. I have my fingers crossed that I will be a lucky winner.